Universal Design Symposium – 26 October 2016. ANZ Viaducts Events Centre, Auckland. Environmental visual literacy occurs at the interface between design and users. It relates to the way in which users ‘read’ visual cues embedded in the built environment and make sense of these in a meaningful way. These visual cues include design details that may support or hinder engagement, orientation, wayfinding and the safe performance of daily activities. 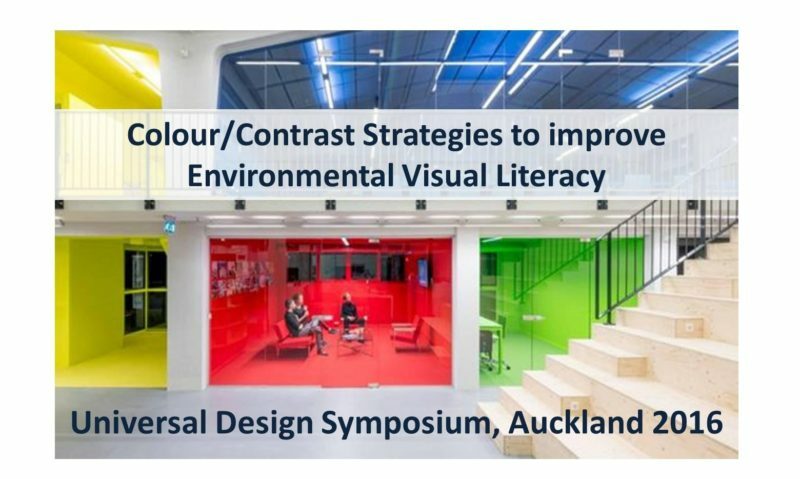 Specific Colour/Contrast strategies can improve environmental visual literacy and have a positive impact on engagement, orientation, wayfinding and the safe performance of daily activities. An Environmental Visual Literacy audit and checklist provides a means to identify strengths and weaknesses in the built environment. Outcomes from this audit can be used to inform modifications to the built environment that use colour/contrast strategies to improve environmental visual literacy. The Universal Design Symposium was opened by Auckland Mayor Phil Goff and the keynote speaker was Valerie Fletcher, Executive Director of the Institute of Human Centered Design in Boston. For more information about the Universal Design Symposium and key speakers, go to the Symposium program link. Check out check out information provided by the Auckland Council (and the team responsible for the Auckland Design Manual) here. Functional environmental visual literacy dovetails with ageing-in-place as well as design guidelines that support Universal Design, Intuitive design and design for people with dementia. These all tend to focus on an effective design/user interface that supports positive outcomes for all people irrespective of age, cultural background and visual, cognitive or physical capacity. From an environmental visual literacy perspective, the environmental design/user interface can be problematic. On the design side, various design factors can either support or hinder effective environmental visual literacy. From a user’s perspective, this interface relies on functional visual perception, memory and cognitive processing. However, a proportion of older people experience declining visual and cognitive capacity, and this can impact their environmental visual literacy. This deficit can in turn affect levels of engagement plus impact orientation and wayfinding, and the safe performance of daily activities. Due to the mechanics of visual perception, colour and especially contrast play key roles in environmental visual literacy. While declining memory and functional mental capacity cannot be resolved, colour/contrast strategies address some of the shortcomings in environmental design and perception, and help older people to more easily identify and process visual cues embedded in the environment. Evidence-based colour/contrast strategies can be incorporated into design of the built environment to improve environmental visual literacy. These strategies, which dovetail with ageing-in-place and guidelines for Universal Design, Intuitive design and design for people with dementia, have the capacity to improve engagement, support orientation and wayfinding, and contribute to the safe performance of daily activities. This presentation was made possible with the generous support of Resene Paints, New Zealand.